It's a bird, it's a plane, it's megaship!! Ketchikan, Alaska - OMG, a cruise ship blocked out the sun this week! 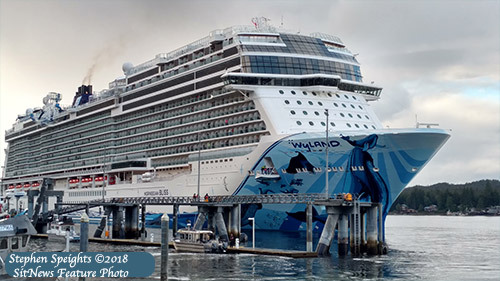 Norwegian Bliss is one of the largest ships to sail in Alaskan waters making her debue in Ketchikan Monday morning - June 4th. At least that is impression that I got from Facebook, where posting after posting after posting appeared of photos the "Great Blissful Norwegian Eclipse of 2018." Geeze, you would have thought these people had never seen a cruise ship before. But what a ship! Nearly 1,100 feet long. Twenty some stories high. Around 4,000 passengers and somewhere north of 1,500 crewmembers. All rushing off Berth 3, looking trying to hitch a ride to Walmart. I get that it was the biggest thing - in an industry saturated with big things - to sail into these waters. 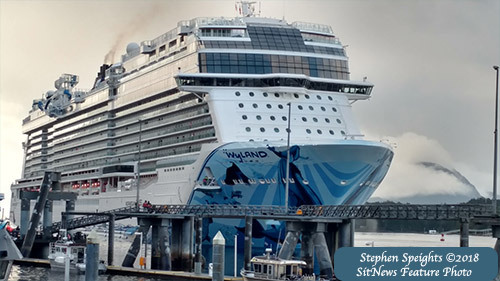 If - like me - you remember the sedate old days of the Princess Patricia and the Prince George, new ships like the Norwegian Bliss can seem positively gargantuan, great levitations that must challenge all the accepted laws of naval architecture. I mean, I don't get it. I throw a rock in a pond and it immediately sinks. The Bliss weighs 168,000 tons. That's about 300 million pounds. If I threw something that big in a pond, it would sink. Right? At any rate, the Bliss does more than float. It glides sideways along the Inside Passage, a horizontal MGM Grand Hotel and Casino, that features more restaurants that I can count, an Aqua Park that could shame Schlitterbahn, an inside laser tag facility and an honest to A.J. Foyt go cart track on the upper back deck. The only thing more gargantuan than the amenities on the Bliss are likely the lines to take part in them. It must be like Disneyland on Labor Day, packed at all times. I bet you get in line for the go kart track in Seattle just so you can take your ride when it slips into Skagway. Still, I am left with a little of "what's the big deal" hangover on this one. Yes, it is the biggest ship to show up. But for how long? Word has it that a 5,000 passenger one may come next year. And then maybe larger ones in a few years. I expect to live in a time when 3,000 passenger ships will be called "boutique" cruise ships. And 2,000 passenger ships will be used to "liter" passengers ashore when the main ships have become too large to fit in Tongass Narrows. In reality, though, the Bliss is only an incremental increase from the ships that have been arriving the past few years. It may be 100 or so feet bigger, it may have 1,000 more passengers. But it not the "game changing" event that all the Facebook posters are heralding. Given the Facebook reaction, you would think we are a tribe of primitive people, prostrating ourselves in panic before the sun disappearing behind the moon and foreshadowing an unimaginable disaster. We only react that way when the sun actually comes out from behind the clouds, twice a year. I was out in my father's trolling boat in 1970 when the first real "big" cruise ship arrived in town. It was the MS Arcadia, a 1950s era super-cruiser that was 700 feet long and had - wait for it - 1,300 passengers. That was in an era when nearly all the other ships were less than half that size and carried - at most - 300-400 passengers. and capacity for 4,000 passengers. The Arcadia created a stir. At least I think it did. I can't seem to find any selfies involving it on any 1970s Social Media. "History" on Facebook refers to last week. But I clearly remember the waterfront rubbernecking that took place. We were on our trolling boat coming back from the oil docks south of town. We circled around the Arcadia, once, twice, three times looking at its massive hull and the hundreds of people on the decks. Even my grizzly old fisher-father seemed overwhelmed by the sheer size of the Arcadia. And quite a few other boats sidled over for a look see. Even a couple of Grumman Gooses taxing for take off came a little out of their way to take a gander at the big ship before embarking for the airport on Annette Island. And yet, despite the fact that the Arcadia seemed as giant as the Statue of Liberty sitting in the harbor, it did not block out the sun that day. 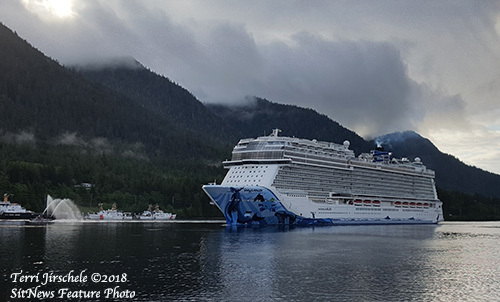 Like most summer days in Ketchikan, the sun was already blocked out as a persistent rain fell throughout the Arcadia's visit. Just as it did for the Norwegian Bliss this week.